Wellness is a significant factor when we design spaces from breakout areas to biophilic features, to mother’s rooms, sit-stand desks, and more. But wellness is not just for clients, it’s for IA too, a passionate staff-chosen and staff-directedagenda unique to each IA office and aligned with its culture and location. Activities focused on physical and mental health include fitness, movement, nutrition, team sports, and special events, running the gamut of activities. 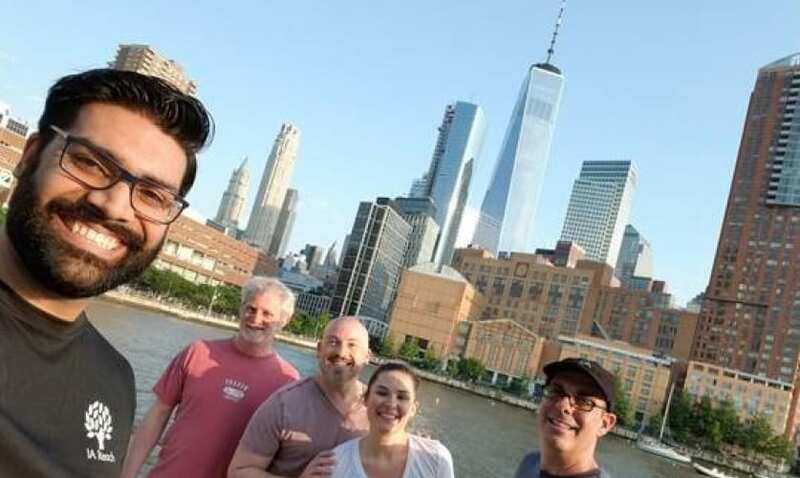 Regularly scheduled yoga classes and meditation sessions, weekly running and walking clubs, nutritional counseling, and multiple stair challenges (for one office that means up and down eight floors once a day) are just a few of the on-going activities. 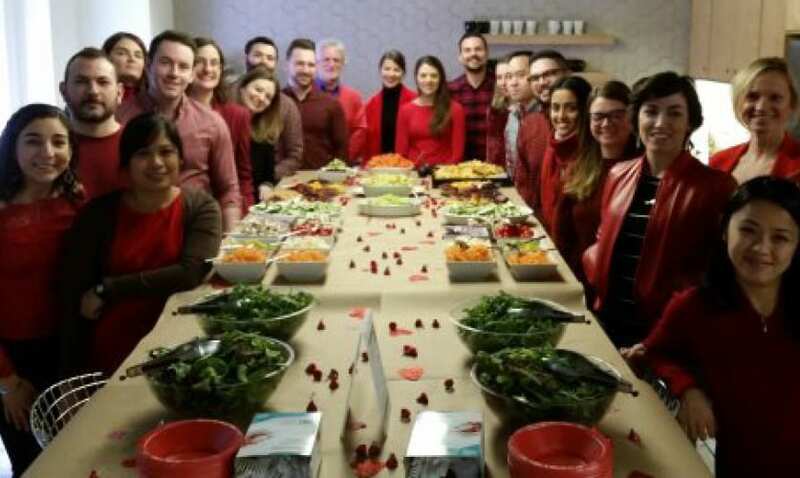 Special activities include Ergonomics Week, bring your pet to work day, an urban farming video series airing in the pantry, chair massage, a basketball tournament, and a standing beach volleyball team known as IAce. Of course, healthy snacks, filtered water, and access to natural light are a given. 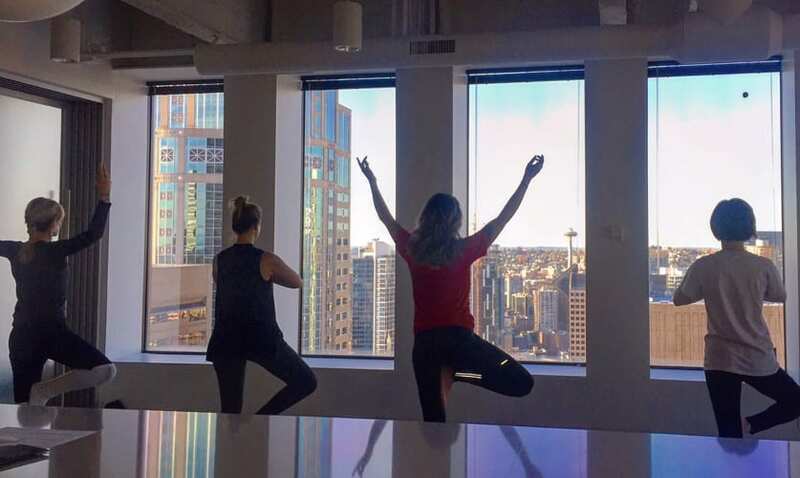 IA staff practice yoga in the Seattle office. Wellness Wednesday (the alliteration was too tempting to pass up) is a monthly event in one office with a different agenda for each meeting: foiling allergies with turmeric and ginger juice from a local juice shop; creating your own desk flower arrangement (vases and flowers provided) and a discussion of biophilia; and pursuing healthy sleep cycles plus building the perfect goodnight snack, to name a few. At IA’s San Francisco office, desktop floral arrangements are made by the team. 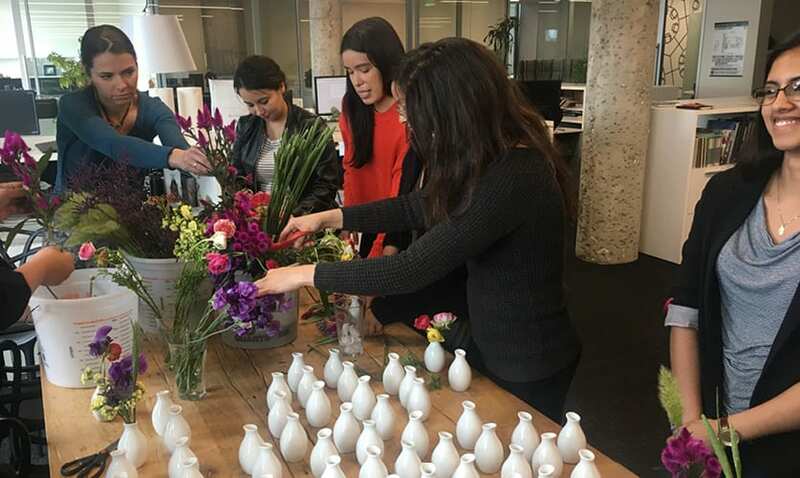 Company-wide activities also play a part. This spring all IAers were presented with a custom Hydro flask, complete with IA logo, and this month the winners of the eight-week IA Ready Set Go Challenge were announced. Focused on movement, the winning team of 10 participants took a total 7,036,780 steps; the two highest individual achievers took 1,127,698 and 1,028,394 steps respectively, and in the eager beaver category—most steps in the first week—the top two winners chalked up 142,495 and 115,368 steps. This competition, with its emphasis on movement, reflects the latest medical research that makes a distinction between movement and fitness activities for wellness. Runners rack up steps for the IA Ready Set Go Challenge in New York. IA staff gather for a healthy meal prep demonstration.